Caedmon Anderson recites the Preamble to the U.S. Constitution then went on to say America's Creed. 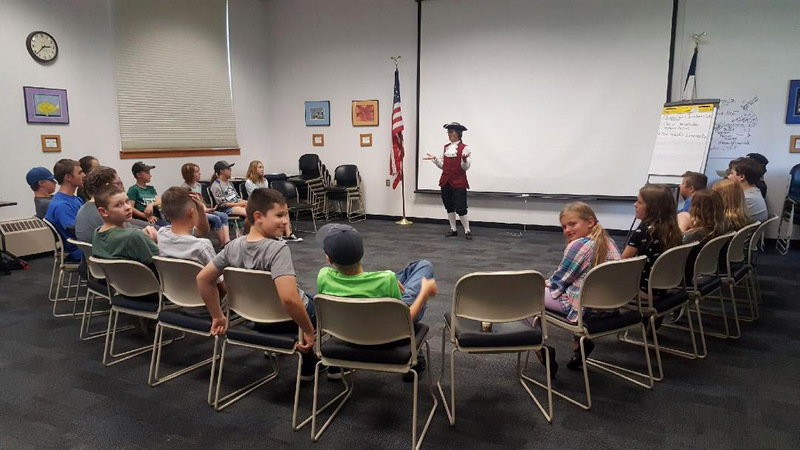 Students at Sunset Elementary School listen to a Constitution Week presentation by Debbie McClain, chair of the Constitution Committee of the local chapter of the Daughters of the American Revolution. 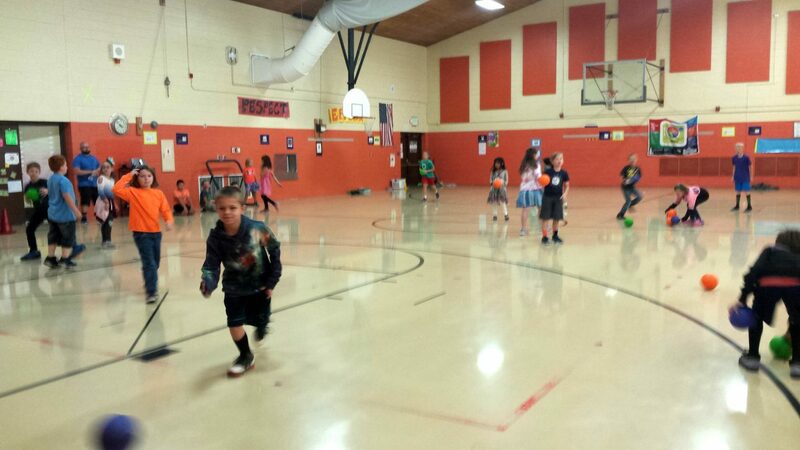 Constitution Week got physical in John Ford's physical education classes at Sunset Elementary school. 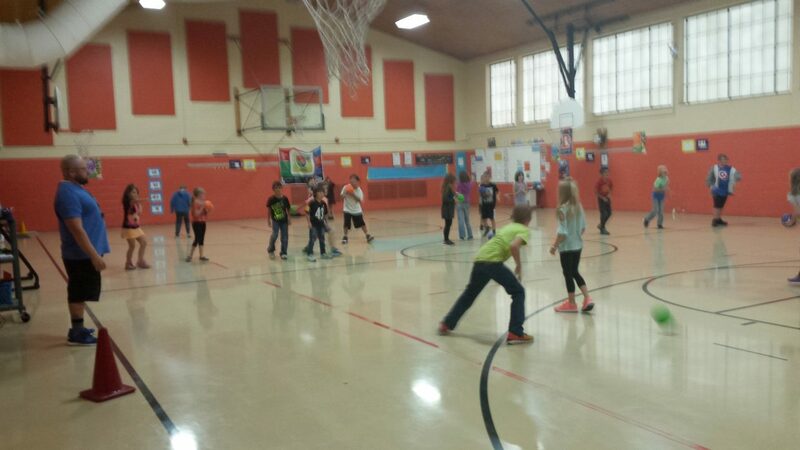 Students learned fairness in representation during their games. 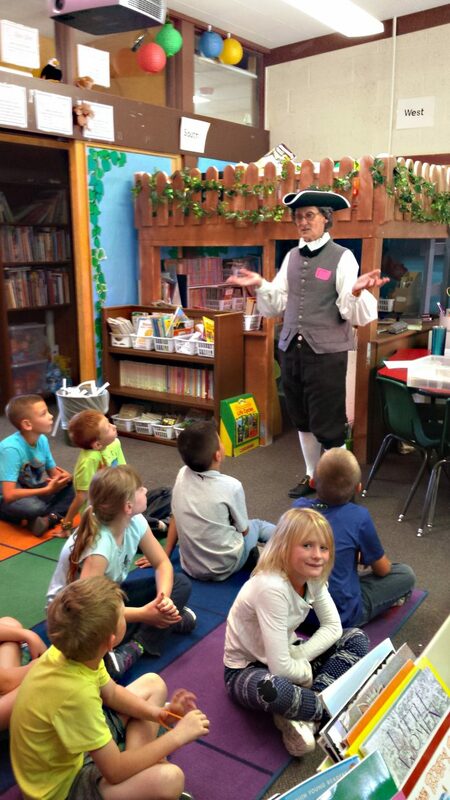 Students attending Moffat County Shared School joined in Constitution Week events. 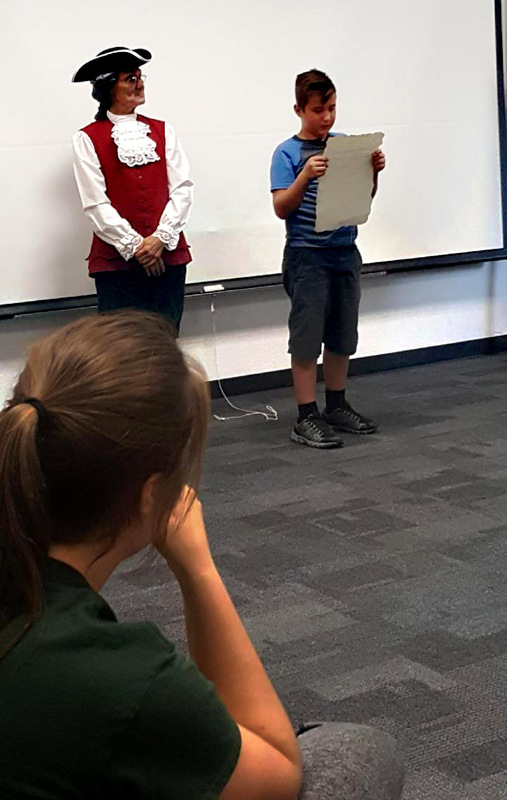 Elijah Jantz, a second-grade student at Maybell Elementary School, recites the Preamble to the Constitution by memory. 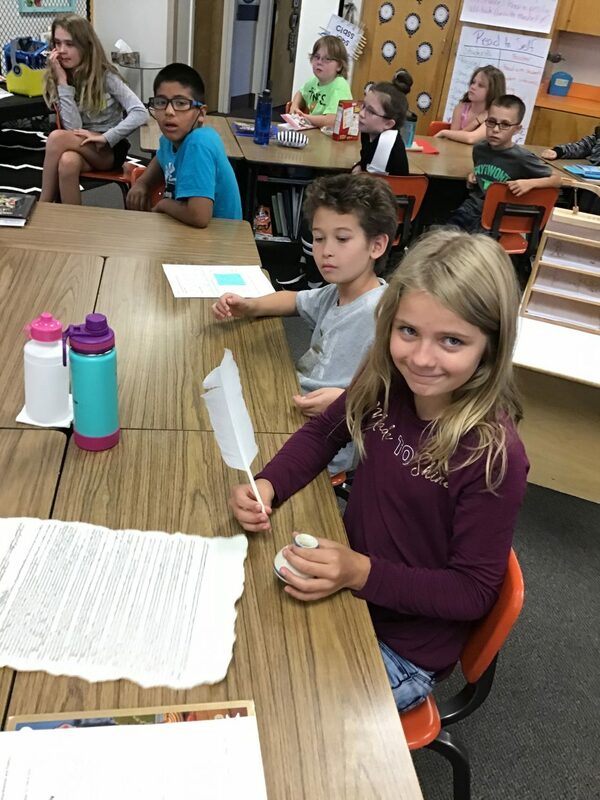 McKinlee Robinson pretends to sign the U.S. Constitution with a quill pen as part of Constitution Week lessons. 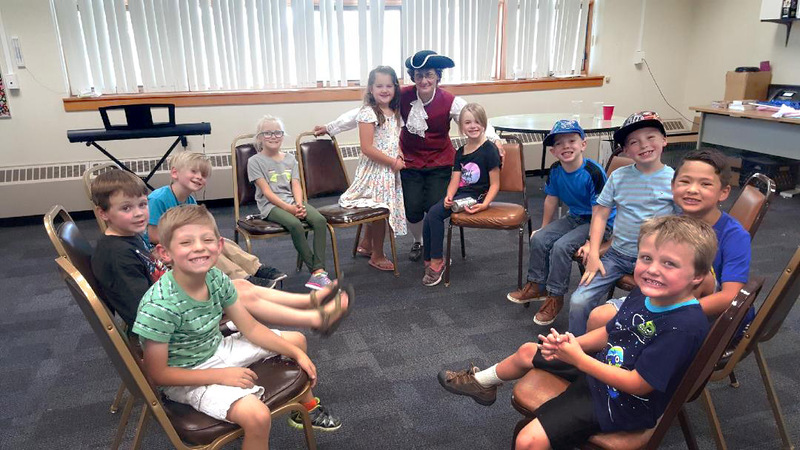 DAR constitution committee chairperson Debbie McClain brought history to life for students providing over 20 programs to all of Moffat County's public and private elementary schools during 2018 Constitution Week. 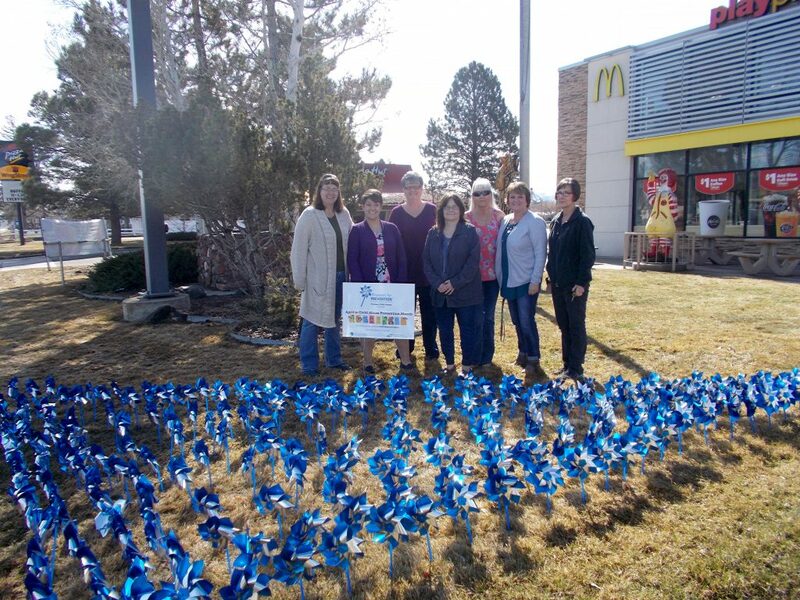 Posters made by students from Moffat County Christian Academy decorated city and county buildings during Constitution Week. 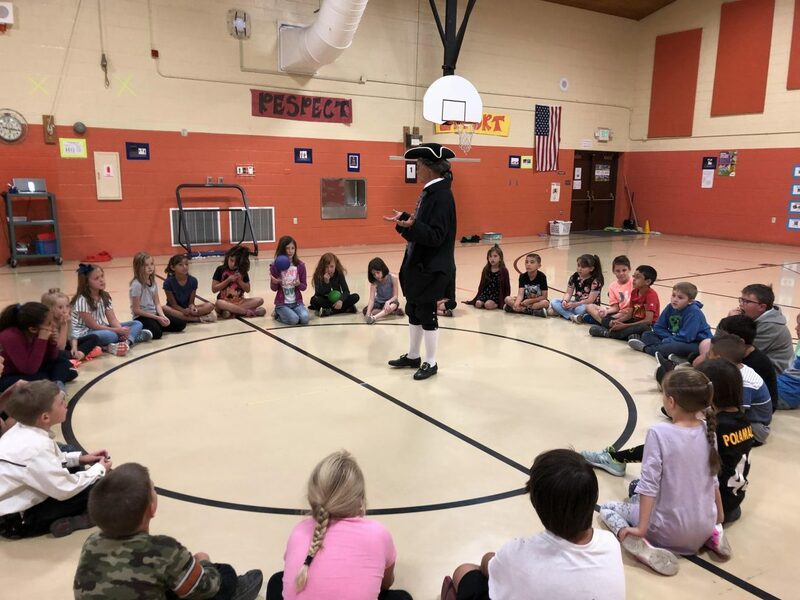 CRAIG — Last week, elementary school children at all private and public schools in Moffat County celebrated Constitution Week with more than 20 special presentations. 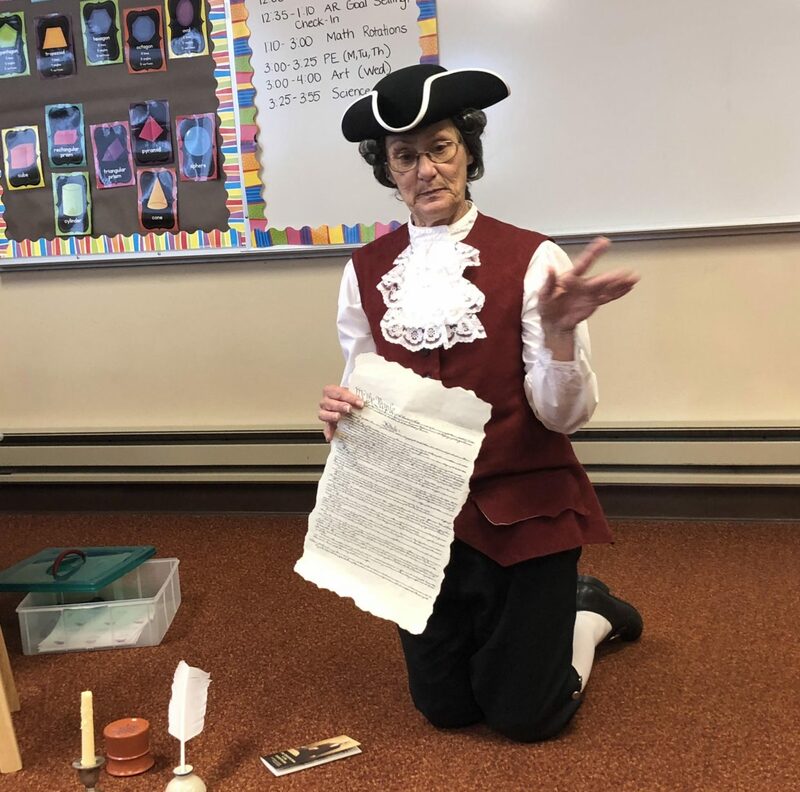 Debbie McLain, chair for the Constitution Committee of the Augusta Walihan Chapter of the Daughters of the American Revolution, visited school dressed in clothing and using props from colonial times to help bring history to life, something she had been doing for many years. 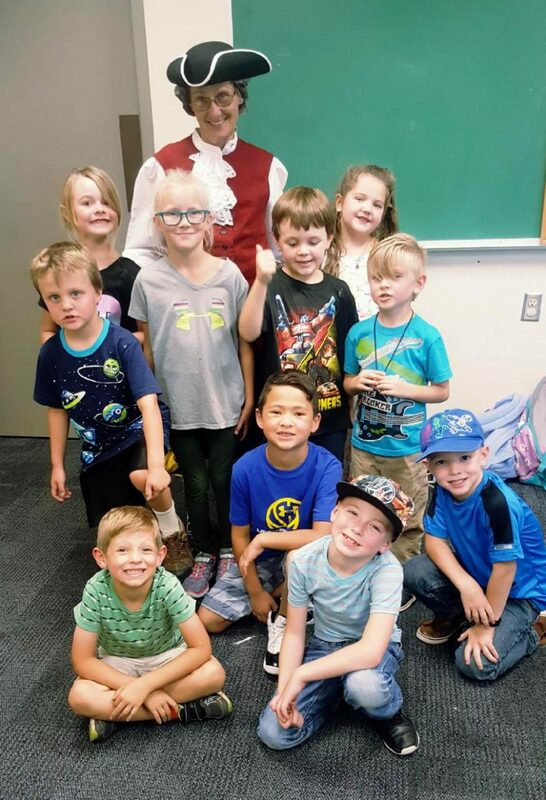 This year, McLain was impressed by students’ knowledge of the U.S. Constitution and the creative ways teachers incorporated it into their lesson plans. 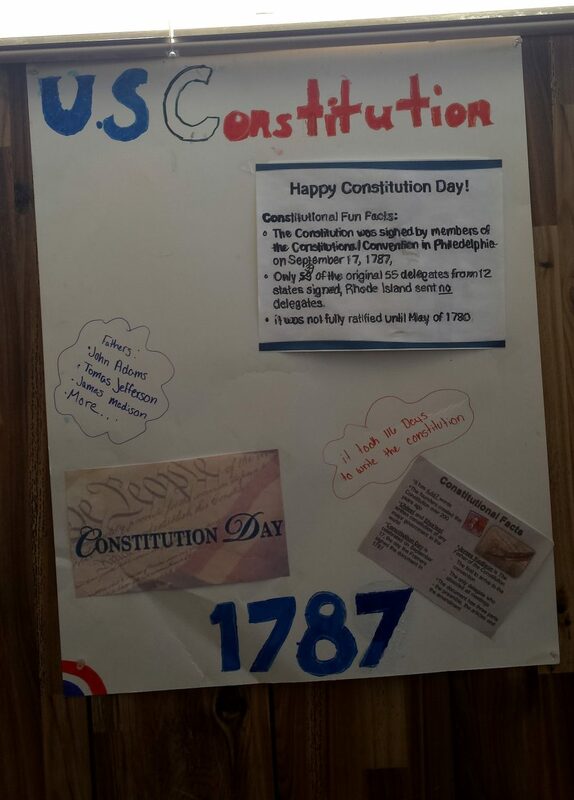 For example, two students at Maybell Elementary School recited the Preamble to the Constitution from memory. 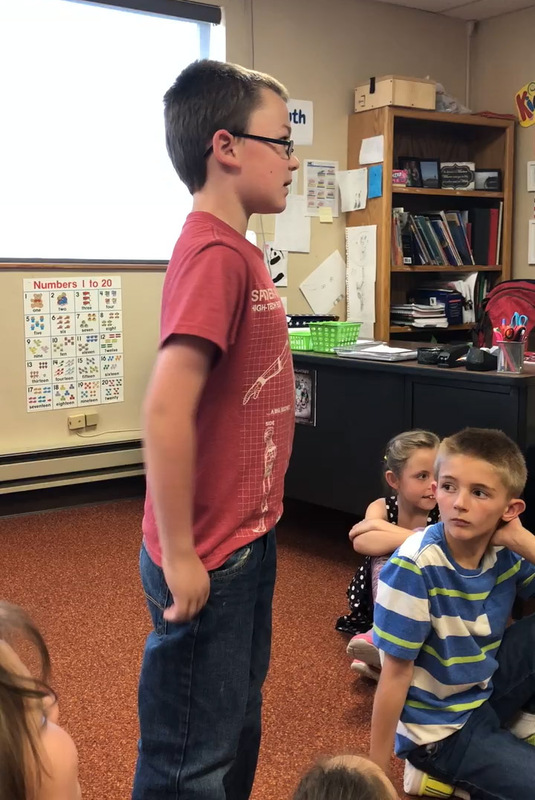 Caedmon Anderson, a student at Moffat County Shared School, also recited the American’s Creed following his recitation of the Preamble of the U.S. Constitution. 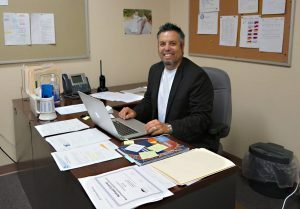 “Not even all our members have that memorized, even though we read it before every meeting,” McLain said. 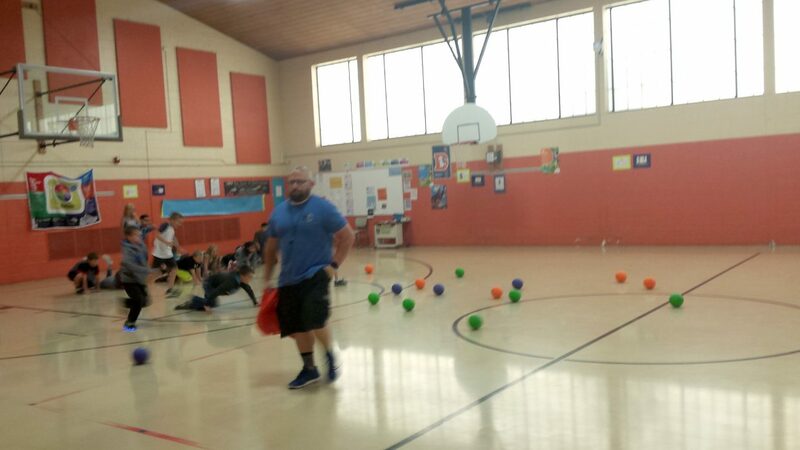 Political football took a literal turn in John Ford’s physical education classes at Sunset Elementary School with Constitutional Dodgeball — a game designed to illustrate the challenges of deciding how to create fair representation in government. 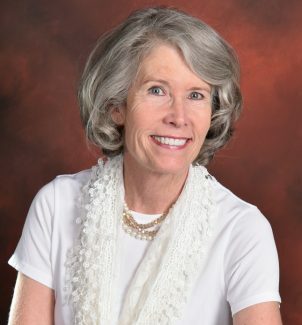 “When the Founding Fathers were putting together the Constitution, they had a debate over how to put together the lawmaking body (Congress). 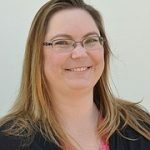 Some wanted each of the states to be equal in power; others wanted more populated states to have a bigger voice,” Ford wrote in his lesson plan. 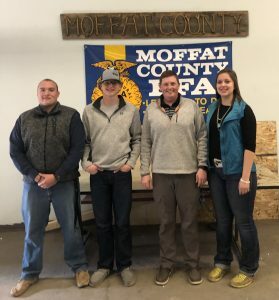 At first, most of the students and the balls were given to a team representing a state with a large population, while fewer students and balls represented the lesser-populated states. After the larger state won, the balls were redistributed to even the odds. 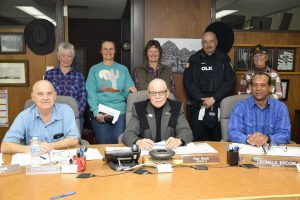 “He had it very well planned out,” McLain said. Daughters of the American Revolution petitioned Congress in 1955 to set aside Sept. 17 through 23 annually for the observance of Constitution Week. The resolution was adopted and signed into law by President Dwight D. Eisenhower on Aug. 2, 1956.